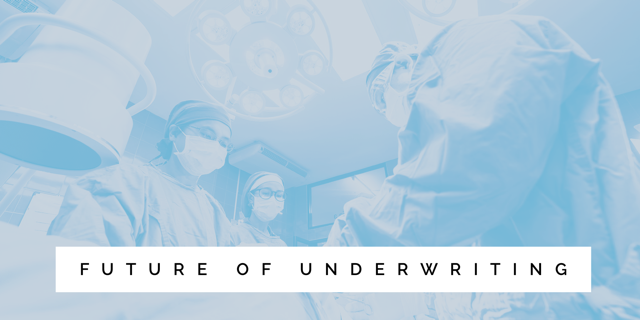 We asked some industry experts to give us their predictions of the future of underwriting. As an ex-underwriter (well, until the claims started to roll in) I value the importance of underwriting. I have seen first-hand clear evidence of a customer attempting to defraud as well as seeing those marginal claims that present at a ’grey claims committee‘. Underwriting is an integral part of the risk selection process and will impact the performance of a company portfolio. But little has changed with the process for many many years. Sure we have digitalised the process with the use of sophisticated underwriting rules engines in the desire for high straight through processing rates. However, we have followed the same application process since Noah was a boy and that includes whether we trust the disclosures made by our customers. Trust is a two-way street. We ask our customers to trust us when they take out a protection policy. We ask them to believe that when they start paying us premiums via direct debit, we will pay either them or their estate for a claim should that actually occur. We ask them to trust us not to wriggle and squirm behind smallprint and that request for trust could last a very long time. Recently we have started to ask them to trust us with the use of data from wearables and nearables. With this as a backdrop, should we not return the compliment as well? A simple start would be to trust the information that they provide in underwriting an application, especially from a professionally qualified adviser. Sure you will always hear about the odd bad apple but, for the odd one of those, there are many more advisers who go about their work providing a first class service to customers. Helping them put their financials affairs in the right place. Take the team at Future Proof for example. This firm is seriously good at what they do for both new and existing customers and when they do not have the in-house expertise, they partner with like-minded people Meg Kirby at Legacare. In many ways, we are going to have to trust our customers anyway. Just look at individual NHS records held at your customer’s GP practice. How complete are those in reality? There are literally millions of private GP consultations every year. How many of those are really transferred to the customer’s master records? If your customer does not give permission to the private GP then this cannot occur. Looking forward, I can see less reliance on old records (and I applaud the work that is being undertaken in digitalising the whole process of obtaining them) but more reliance on believing the customer and obtaining an up to date snapshot of the customer via some form of medical screening. This is a similar model that is very similar to the American market. They have no GP records system as such, so an up to date medical view of the customer is very common, even at relatively low sums assured. But would these increase medical bills? I don’t think so when you consider the cost of a GP record against the cost of a basic nurse screening. These screenings are now easier than ever to obtain, can be uploaded into systems very easily and, given the structured nature of the data provided, can be underwritten in seconds using the same underwriting engines that requested the screening in the first place. Speak to any doctor and they would suggest that a full blood profile is undertaken to give a complete picture of the customer. Given the numbers requested on a daily basis these are very competitively priced. However certain blood tests can be undertaken via fingerprick testing rather than venous blood testing if you specifically want to test for cholesterol or blood glucose so it is less invasive for the customer. You can also provide the results of the screening to the customer and arrange a remote consultation if there is an abnormal result. We provide the customer with a copy of their application form with the policy documents so why not do that as well? How is that for customer centricity! You don’t have to always request new information. If the customer has just undertaken a health screening or MOT, this can and should be used. More people than ever now understand the value of regular health reviews. You should see the number of screenings bought for family members as Christmas presents! Looking further ahead, the picture may very well change again when we each have individual ownership of our medical records digitally. This potentially is ripe for a true disrupter business to again re-write the rulebook. A Bought By Many style business for the life industry. However this is still some way away. We need to underwrite individual business to ensure that the very competitive terms we offer can be maintained. However we also need to move with the times and recognise that our customers are acting in a very different way, have different expectations of us and, if they want a relationship with us, that has to be a two-way street. We often talk, in our industry, about the Protection Gap* (the difference between what cover we estimate should be in place, compared to what is actually in force across the market); so much, in fact, that it has become a cliché at conferences and in the trade press. Despite its proliferation, however, the public at large remain blissfully ignorant of this terrifying statistic, just as they do about most of our products, prices and benefits. Increasingly, the real gap – chasm in fact – we should be addressing, which our potential customers are familiar with, is between what a modern shopper expects to see when buying insurance and what we as an industry present them with. Overwhelmingly, purchases of intangibles products like insurance begin online, often at a price comparison website (PCW). Whether or not you are a fan of PCWs, or think they encourage too much focus on cost and don’t offer the guidance and support needed when buying cover as important and infrequently bought as protection, is irrelevant. They are as much a part of a modern consumer’s life as Apple technology, social media or Ant and Dec; inescapable and, for the most part, seen as a good thing. Frankly, without the PCWs and a couple of notable exceptions in the insurer ranks, there wouldn’t be much publicity reaching Joe Public’s various screens on the joys of Life Insurance at all. Give very few details (name, DOB, smoker status, product type). See a range of quick quotes. Choose one or call for help. Go to your chosen insurer’s website to buy. After which point, the real job of purchasing insurance begins (also known as ’underwriting’). Until now, a 25 stone stunt driver with a hand-gliding hobby and a holiday home in Beirut, would have seen the same premium as the Brownlee brothers, assuming they shared the same birth date. Only after the journey through the insurer’s extranet would a real price and ability to buy get revealed – if you don’t like what you see, head back to ’Go’ and definitely DO NOT pick up £200; see if insurer number 2 (having asked you, to a layman’s eye, an identical set of questions) can do any better. And by the way, if you have the temerity to want to buy more than one product, from different insurers, you have to repeat the buying process each time! This clunky experience is totally out of synch with what every other sector is doing and, therefore, entirely at odds with what customers expect. As an analogy: you visit John Lewis online wanting to buy a television, blu-ray player and stand. Having ascertained which products you want, based on their cost and the extra features John Lewis have brought to your attention, you add a Sony TV, LG blu-ray, and an own brand stand to your virtual basket. Imagine they now asked you to visit three different websites to fill in your delivery details, credit card number, warranty options, marketing preferences etc. Imagine Amazon suggesting you complete your four holiday-read purchases with the four publishers you’d chosen. Bringing the examples closer to home (and for that matter motor, pet or travel…), imagine seeing a price for your buildings and contents cover, before you’d told the insurers whether or not your last five properties burned down in mysterious circumstances; or a premium for your car insurance prior to any questions about the power and value of your car. These scenarios are laughable, yet this is precisely what we present to those wishing to consider protection. Not only is our cart before our horse, the rest of the world has started using hover-vans while we tried to work out what was wrong. Incidentally, the picture I’ve tried to paint here applies to consumers buying directly, when of course many may start online but prefer to transact through an IFA or another intermediary. Far from diluting my point, the same frustrations and inefficiencies are felt even more keenly by those trying to sell protection cover to their clients on a day to day basis. The biggest step forward our industry can make in terms of underwriting will be to present customers and intermediaries with a modern, seamless process by which they can compare genuine, personalised prices, without the need for repetition and out-dated buying conventions. This doesn’t mean a homogenisation of underwriting ethos – quite the reverse, since digital technology frees underwriters from the twin shackles of reliance on busy IT departments, and paucity of management information. If we can bridge the gap between ourselves and our customers’ and key stakeholders’ expectations, the other gap will genuinely start to shrink. The good news is we’re just about to make it happen.